More than five million properties are at risk of flooding in England alone. 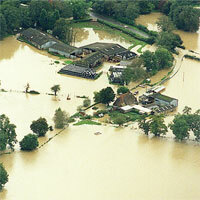 Widespread flooding in the UK during winter 2015/16 has caused serious harm to life and property. Similar serious flooding incidents have occurred throughout the past decade and the threat of flooding as a regular event is now a major public concern. This is reflected in the volume of enquiries to the Citizen Advice Bureaux and other advisory bodies, regarding individuals’ rights and responsibilities when widespread flooding occurs. There have been dramatic reductions to public funding of flood defence schemes under the austerity agenda. The winter flooding of 2015/2016 could see an easing of this policy but only if public pressure keeps flooding at the top of the political agenda. The government is encouraging partnership arrangements for building new flood defences and self-help by affected communities. Getting commercial interests involved to fund future defences may be the key to unlocking the provision of area-wide defences that in the past would have been provided through the Environment Agency or local authorities. Pressure from local communities and businesses together with funding will be needed. Individual property schemes are entirely possible but professional advice is needed to avoid a claim from an adversely-affected neighbour. Choose from the left hand menu options for more information about different types of flooding, causes, and the law on flooding. You can also read responses to top legal questions for England and Wales. Please note that the information provided is not meant to be legal advice. We strongly advise that you seek professional advice to meet your specific needs.